Fresh water pearls adorn the tops of these earrings. 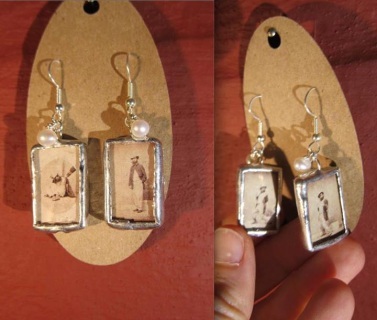 There are four images of a man becoming progressively more drunk (two on each earring: front and back). They're vintage photos, and make a really hilarious and wonderful talking point. ZING!! These get straight to the point. silver tone mirrored metal beads atopped by grey swarovski crystals. Antiqued brass earwires. 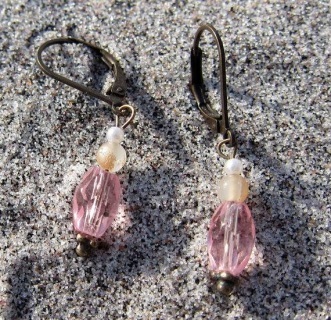 Tiny pearlescent bead on top of an antique faux pearl bead atop an antique faceted pink crystal bead. 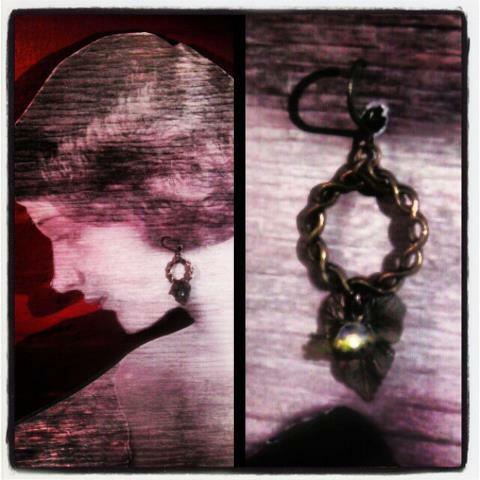 Antiqued brass earwires. 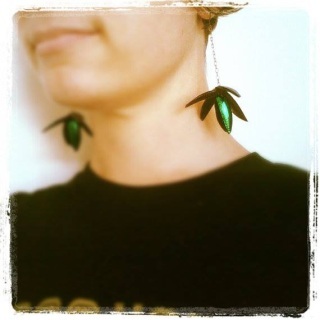 These are such sweet earrings. The green Swarovski crystal above the frosted glass bead reminds me of the first snowdrops peeking up above the snow in February or March. 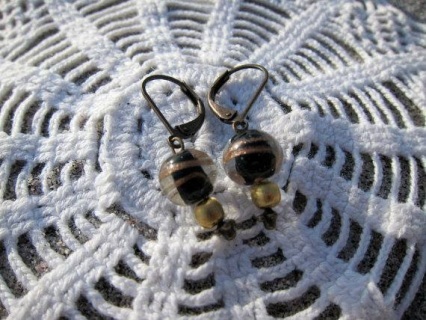 Antiqued brass earwires. Elytra, or wings from the Asian “green jewel” beetle (Sternocera aequistignata) have been used to embellish textiles in Asia for centuries. 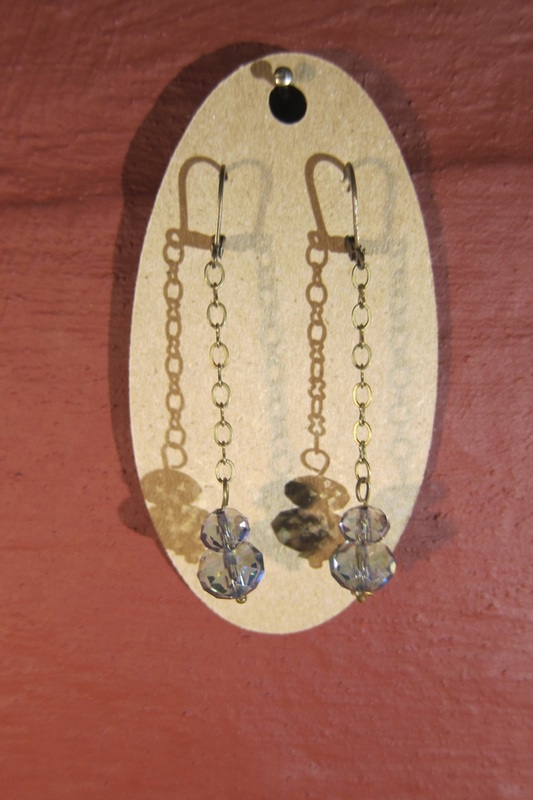 Here, six elytra dangle together in an elegant whirligig at the end of a brass chain. 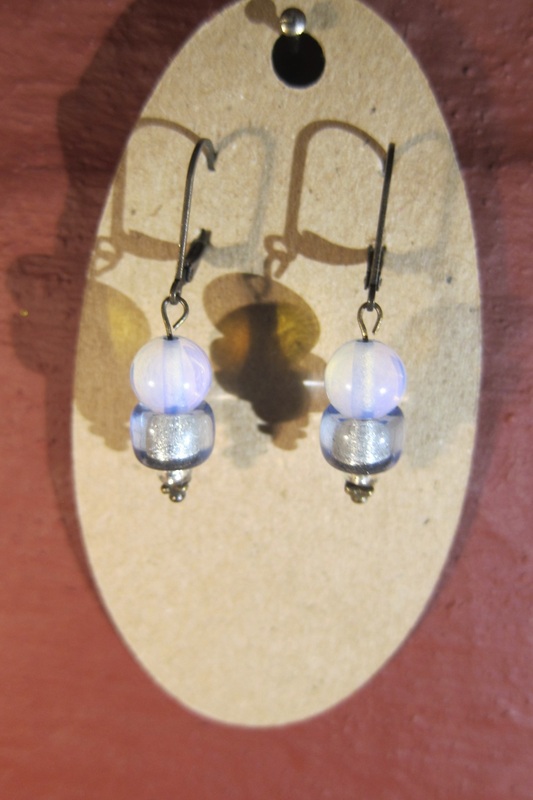 The earrings themselves are also brass and close by hinges so you never have to worry about losing these light and lovely jewels. 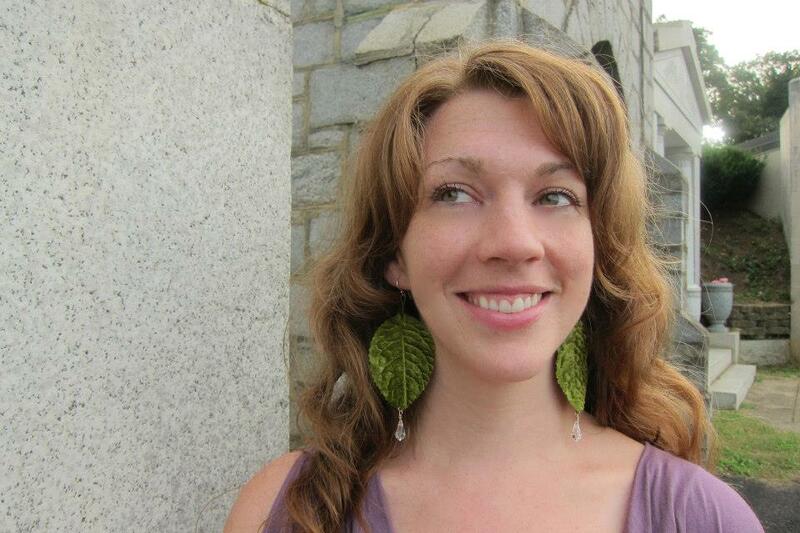 The earrings in the photo are my personal earrings, but I will make a set just like them for you. if you'd rather the chain be longer or shorter, just let me know when you order them. 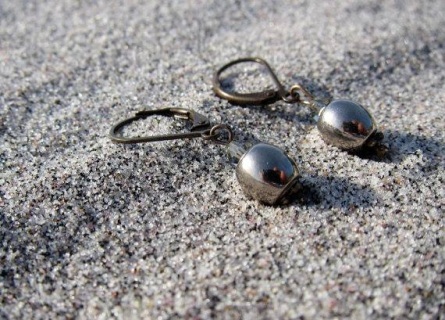 These are THE pair of simple yet sophisticated earrings. Subtley sparkly, navy/black earrings, these are perfectly delectable. They turn you into the most beautiful woman in the room. 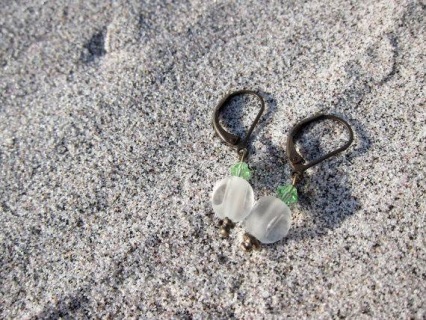 You will get many compliments on these babies. 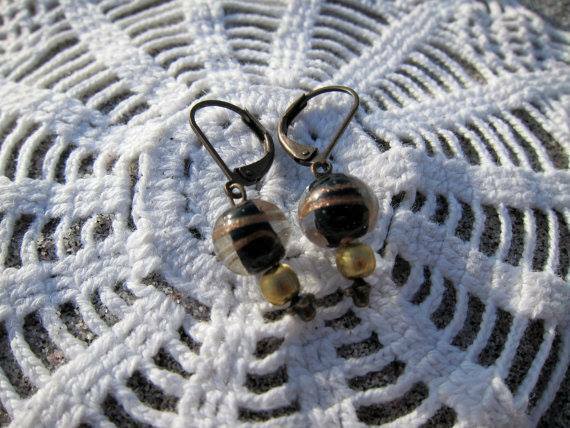 Antiqued brass earwires. These antiqued brass leafs dangle with vintage swarovski rhinestone drops below a circlet of antique brass. These are the whole package; simple, stately, refined. 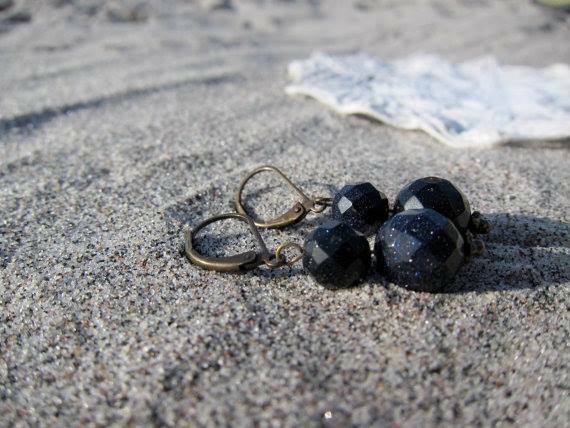 Googly eyes are silly, but these earrings are anything but. They're sophisticated and gorgeous! 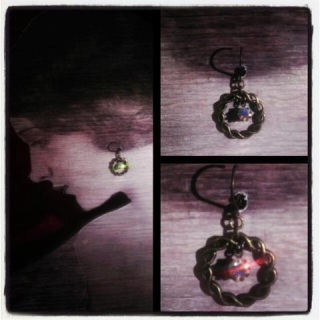 Antiqued brass circlets with a vintage aurora rhinestone drop in the center. Antiqued brass earrings close in the back so they will never fall out of your ears.